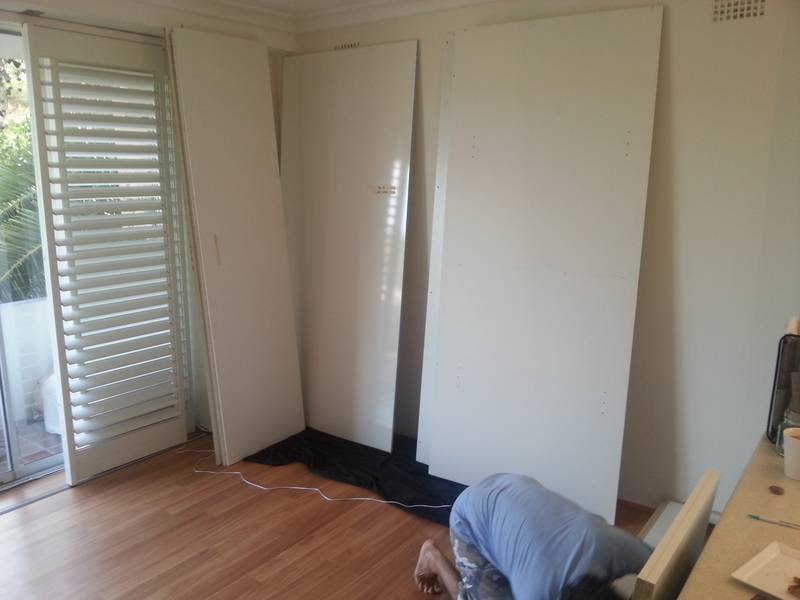 In what has been my greatest DIY undertaking, my Dad (PappaLouie) and I recently installed a wall unit/ storage cupboard in the lounge room of my apartment. Before I go any further it is important to note that I am by no means a DIY genius, so for a project of this magnitude I had to call in the troops (dad and a mate) to help. The morning began with a pile of laminated chipboard stacked against the wall. 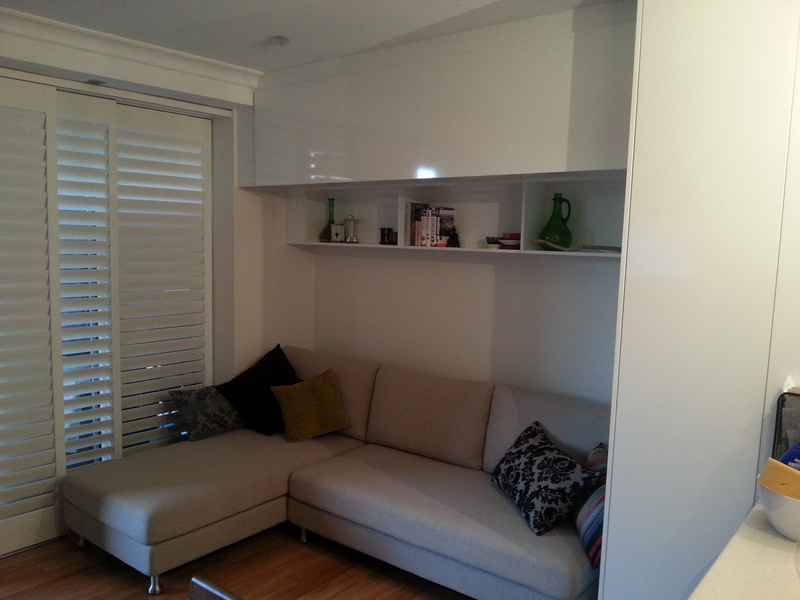 A month or so ago, Dad and I measured up the space and came up with a design that would most effectively utilise the small amount of space that we had to work with and still look good… Well, my fiance was the leader of the design team (she left the heavy lifting and installation to us though). The main concern that we had was that this new addition would change the feeling of the room and make our little apartment feel smaller than it already was. 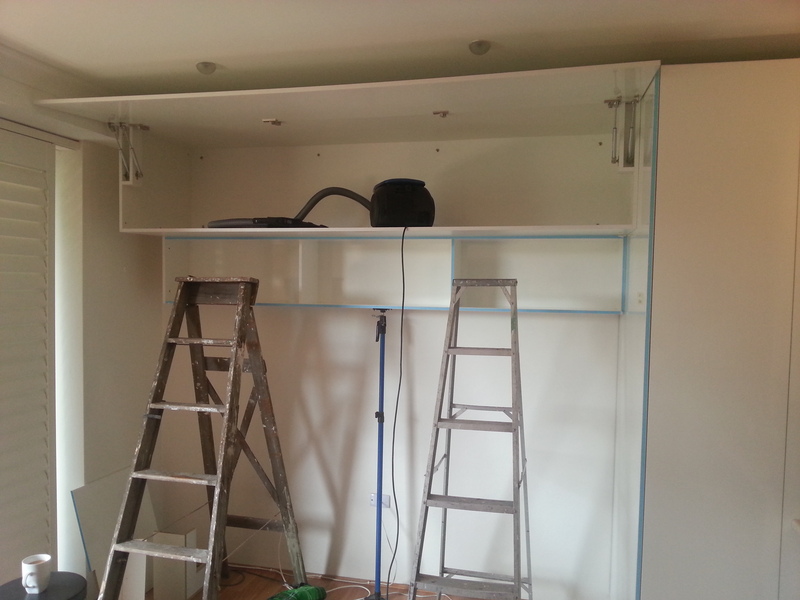 We had the materials cut to order by a professional cabinet-maker and undertook the installation ourselves, saving around $1,500 on the labour. The project took us a day and a half to install and finish off. 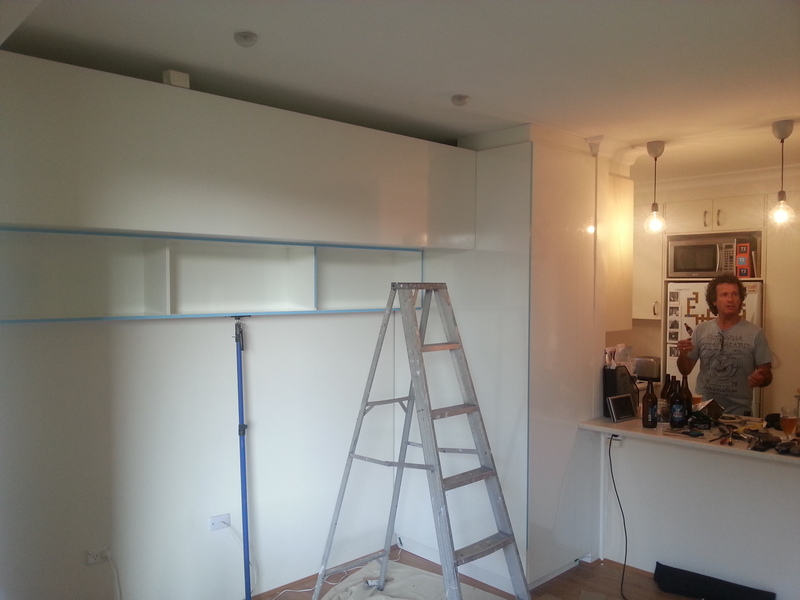 The hinges on the top, horizontal cupboard have been installed using gas shocks which allow the door to open with minimal effort, providing easy access to the surfboards and other sporting equipment that we have stored in that cupboard. We opted for the gloss finish on the visible panels, which did cost us a little more but the end result and look is worth the extra dollars. The fact that the doors are handleless and the unit finishes flush with the cupboards that run from the kitchen, creates a seamless effect which I think opens up the internal space, creating the illusion that it was designed that way on purpose. Standing room only on the balcony. 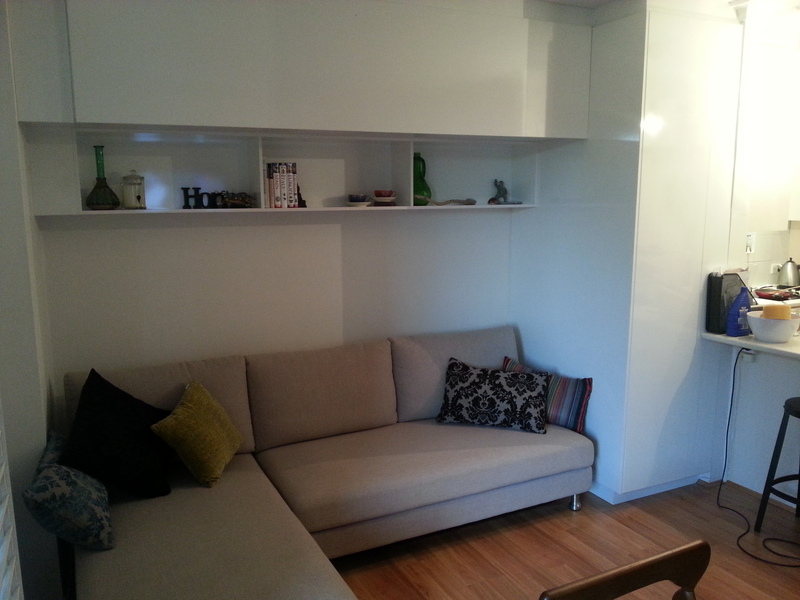 We are absolutely over the moon with the end product and despite our fears, the wall unit actually makes the lounge room feel bigger than it was due to the fact that everything is now stored away out of sight! 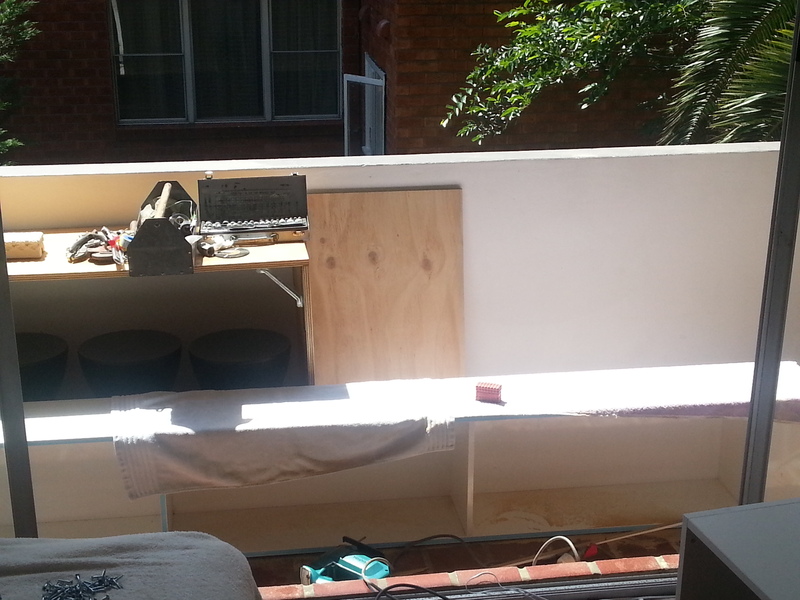 A warning though for all amateur DIY’ers – a project of this scale is no easy feat. There is absolutely no way I could have completed this project on my own with the same end result. If you have any handy friends who are willing to help, accept their offer with open arms. I paid the boys back in kind with pizzas and beer over a couple of games of football, which everyone was happy with. 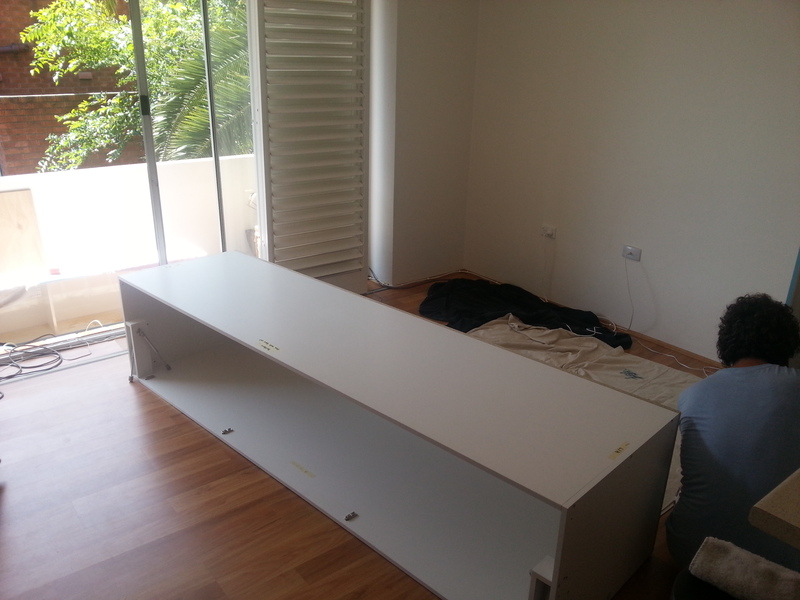 The horizontal cupboard ready to be mounted on the wall. 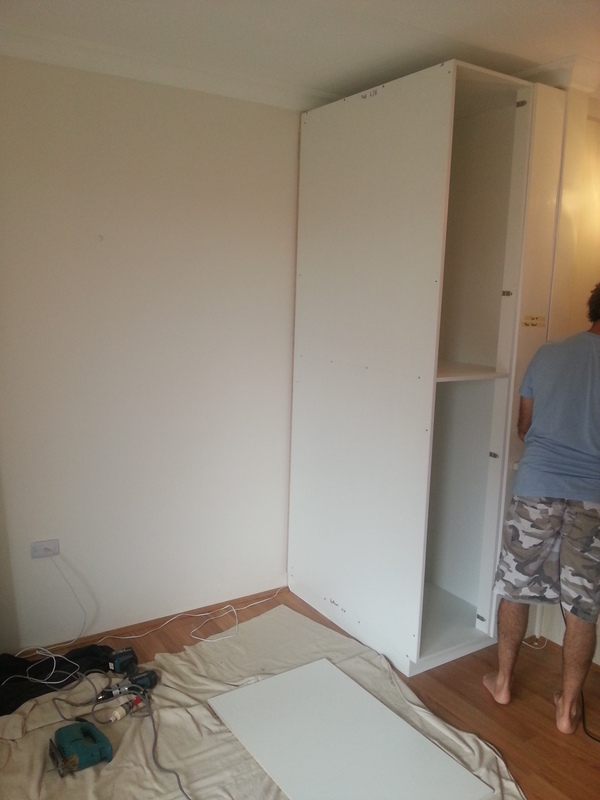 The vertical cupboard was the first undertaking of what turned out to be a long weekend. After 10 hours on the tools, we had built up a thirst. Glad Dad brought some home brewed beer along! Everything is starting to come together. Winter’s Coming and the Sunrises Just Keep On Keeping On. Dude, this looks all kinds of awesome!! Cheers Em. It was a risk in such a small space but turned out really well. Just happy to have the pile of junk out of the corner of the room and into a cupboard! Now that looks fantastic! And a good home brew is the only way to christen any successful DIY project. Thanks very much. A lot of sweat and home brew made for a good time and a good result.